Matt Grawitch grew up in the Midwestern United States as the youngest of 11 children. Having so many role models, Matt developed a variety of interests, and one of those was storytelling. After having children of his own, Matt harnessed his creativity by scripting and sharing stories with them. Unfortunately, a series of tragic events occurred, and Matt and his girls used storytelling as a way of coping with life’s challenges and tragedies. Eventually, the girls fell in love with a story about the Three Wizards, and after a time convinced their dad to begin writing these stories down. And that was the beginning of the Tales of the Three Wizards volumes 1, II and III. Though Matt enjoys writing stories for his girls, for his day job he works as an Organizational Psychologist at Saint Louis University. There, he uses his passion for psychology to teach and publish in a variety of areas. 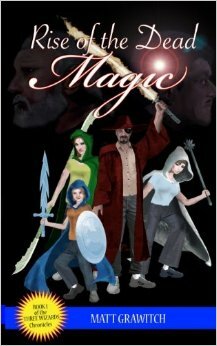 Though he has published numerous scholarly articles, the Tales of the Three Wizards is his first foray into fiction. We thoroughly enjoyed Matt’s amazing presentation of magic tales which will be loved and shall prove to be a huge success by all young children, who have those read to them by their Mom or Dad for exciting and adventurous bedtime stories. We believe this series of magic tales will be approved by all parents, who would proudly like add these volumes to their family libraries, as they constitute a series of literature that will be passed on from generation to generation of grandchildren, and onto to their great grandchildren. In Kindle edition, to be followed by Paperback in the not too distant future. 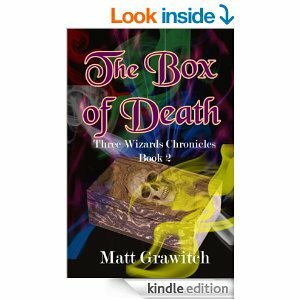 “THE BOX OF DEATH” is an artifact that allows creatures from the abyss to freely enter the natural world – our world – and Malo has control of it. To work, it requires seven magical fragments, but Malo possesses only six of them. It is up to Nikko, Summer, Jolie, and Reece to stop him from locating the seventh and final fragment. If the Wizards of Light Magic fail, the natural world will be overrun by hellhounds, zombies, skeletons, and other even more powerful creatures. And what will happen to Balthazar, the Sentinels, and the next Wizard of Lightning? What role will they play in the battle to come? Will they be consumed by the power of the Box of Death? Fantastic tales to “WOW” the imagination of all young children. Makes great bedtime reading for Parents also.